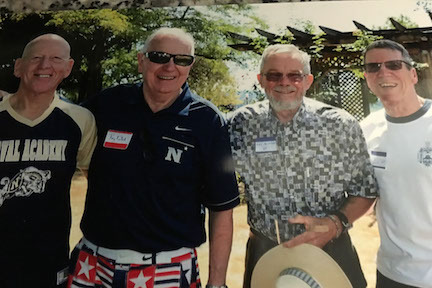 Again this month, we note the deaths of several of our classmates, all good men with whom we shared so many good times, challenges, and lasting friendships. I briefly report their passing here, hoping that you will visit the Last Call section of our web site by clicking HERE to read their obituaries and other remembrances. I just learned of the death of Dudley Mack Weathers (13th) on 9 May 2016. I do not have contact information for his next of kin. Joseph H. "Josh" Fields (13th) passed away on 16 August. His widow, Susan Anderson, may be contacted at 1299 Silverwood Drive, Okemos, MI 48864. Michael R. Jacqmin (13th) passed away on 25 August. His widow, Donna, may be contacted at 1810 Lakestone Drive, Trinity, FL 34655. James C. Williams (7th) died on 31 August after a brief illness. I do not have contact information for his next of kin. Charles W. "Chuck" Stone (18th) passed away on 28 August, ending his nine-year battle against multiple myeloma. His widow, June, may be contacted at 30510 Via Cantamar, Escondido, CA 92026. 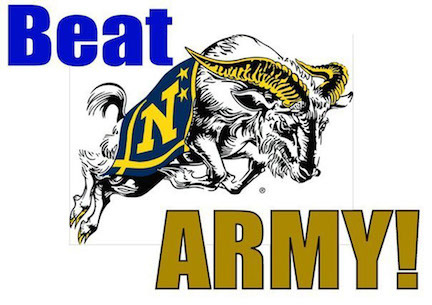 Jack Colyer, who was Chuck Stone's USNA roommate for three years, shared this note which is appropriate as we remember those we have lost. By accident, I came across the following which not only is my feelings for Chuck but for all of the Brigade who have gone before us... "No more watch to stand, old friend and sailor. You are outward bound on an ebbing tide. Eight bells have rung and your last watch is done. A new berth with new orders awaits you on the sea of Eternity with always Fair Winds and a Following Sea." We were also saddened to learn of the death of Bob Polich's wife, Liz, on 21 October 2017. Bob may be contacted at 16146 Seneca Lake Circle, Crest Hill, IL 60403. An annual event for our San Diego area '63 contingent is the Concert in the Park in Coronado. Here is a brief report on this year's event provided by Phillip Marsden. A spirited crew of classmates and ladies gathered for this summer's Coronado concert-in-the-park in July. We were joined by a member of the Class of 2013 and parents of a 2013 member. The photo shows Ted Krohne, Jay Roberts and his friend Karen Miles, Phillip and Martha Marsden, Donna Kaup, John and Gail Pedrotty ('13 Parents), Jim Fontana, Kimberly ('13), Karl and Marirose Kozak, Lee and Sue Cargill. An ABBA cover band had everyone moving and grooving throughout the concert. Thanks to Tom Robertson for this note about a chance encounter with a '63 widow. A very pleasant and surprising '63er sighting to report. By chance, Julie and I met Ron Reihel's widow, Kitty, during return flight to Jacksonville from Colorado. She noted my ring (which many know is actually the ring of Bruce Lenz, my once partner in hi-jinks, on loan from Sally Lenz). Ron died some 15 years ago and Kitty lives in Orange Park, FL. We had some time for chatter and reminiscence about Ron. She, of course, is one of the many vivacious North Florida girls who dazzled and snagged our classmates during operations in Florida. In Ron's case it was a spring baseball trip where Kitty was apparently pursued by multiple team members. Ron's Air Force active duty career blended naturally into one with Eastern Airlines, while he remained in the AF reserve. Kitty relates that Ron was able to play some semi-pro baseball while on active duty. Only in the Air Force, I suppose! This nice encounter proves once again -- "still when two or three shall meet." All is well here. We can't make the 60th because of a prior commitment to the reunion of USS GLENARD P. LIPSCOMB (SSN 685) which I commanded 1978-82. This news of another chance meeting and an unexpected '63 connection came from Tom O'Brien. 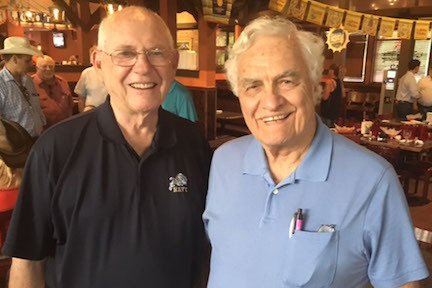 While attending a "meet and greet" at a local restaurant for a candidate in this year's Florida gubernatorial race, I met Frank Schwartz, who turned out to be our classmate John "J.B." Worcester's first cousin. Frank, from Michigan near Big Rapids, J.B.'s hometown, now lives in Green Cove Springs, FL, near our home in Orange Park. 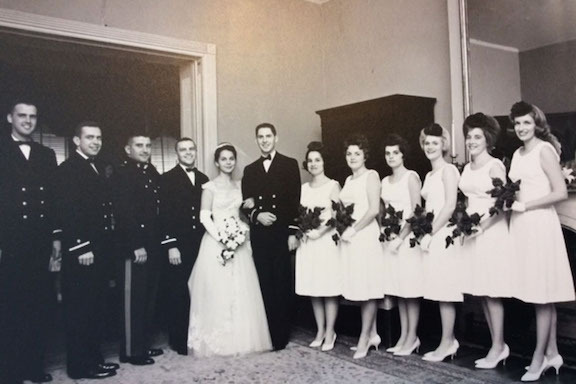 We had a good time reminiscing about J.B.
My classmates J.B. and Ollie Donelan were kind enough to give up parts of their Christmas leave periods and attend Ann's and my military wedding in snowy Lexington, KY, in late December 1963. 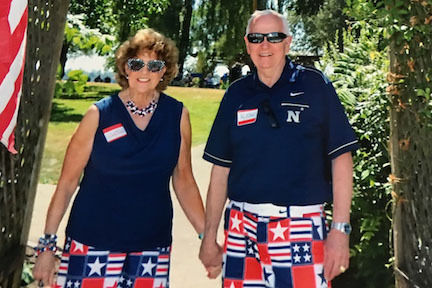 Ensign Lanny Cox '63, who was home in Lexington on Christmas leave, and 1stLT Walter Fitts, USMC (UNC '59), Ann's brother, filled out the military side of our wedding party. I corresponded with J.B. once or twice briefly after the wedding, but never saw him again. He was lost in North Vietnam in October 1965. Steve Coester, our class Webmaster, submitted this account of his active lifestyle and avocations. Yvonne and I are doing well and are in good health here in Rockledge, FL. Since I retired very early we got the travel bug out of our system years ago and now are content to stay near home as the hassle of traveling outweighs the joy. We have one local grandson who we see several times a week and our two Texas grandchildren and our Colorado son just visited us on either end of their SCUBA vacation in the Keys at the end of July. Yvonne spends her time endlessly crocheting beautiful blankets from baby size to king. She has used enough yarn to reach the moon. I have my four avocations. 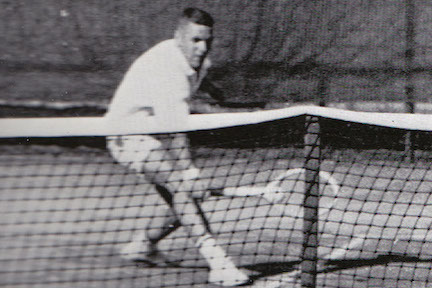 I still play tennis up to five days a week in two different leagues. 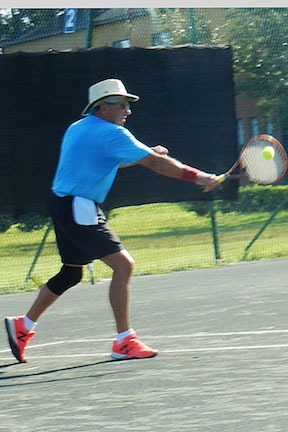 In the older league where you have to be over 65, which is still twelve years younger than me, I play the number one line and last season was ten wins against one loss. So far, I'm undefeated this young season. In over-50 it's a bit tougher but I still have a winning record. Bird and wildlife photography takes up the mornings I don't play tennis. In the afternoons I read for a few hours, but some of those are spent napping with the book in my lap. I read mostly the best seller list but sometimes read some good historical books. Finally, there is my "job" as webmaster of the Class website and maintainer of the class roster. That keeps me in touch with many of our classmates. 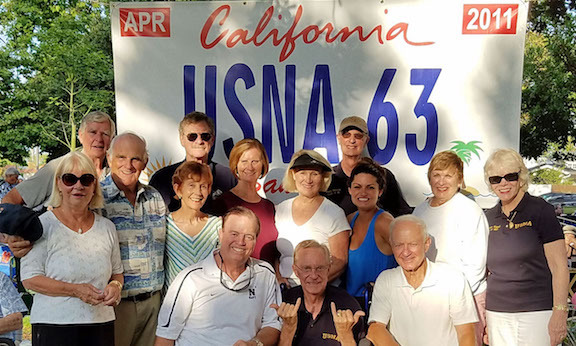 This year it has been busy with preparations for the 55th Reunion in San Diego. The downside is dealing with those of us who have passed on. It's been and still is a great life all made possible by those four years on the Severn. Here are a brief note and some nice pictures from Washington state sent by Ray Kutch. 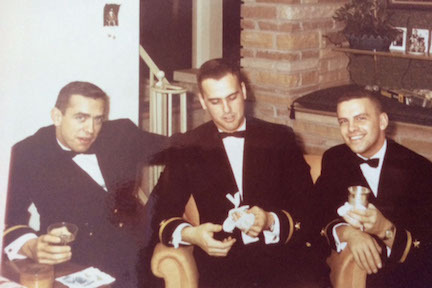 Class of 1963 children continue to serve and advance in our armed forces. The latest news about their progress came in this note from John Fitzgerald. 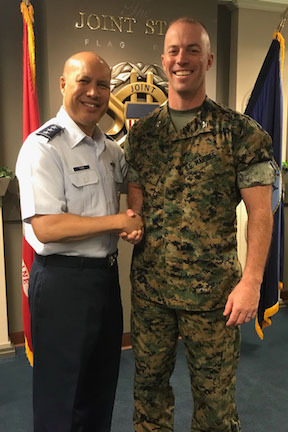 This picture shows Lieutenant General Tuck, USAF, congratulating my son Michael Fitzgerald as he was frocked to the rank of Colonel, USMC, on Monday 6 August 2018. General Tuck heads the Logistics branch of the Joint Staff at the Pentagon where Mike is assigned. Mike expects to make his number as a Colonel on 1 October 2018. That's it for this month. My empty mailbox is ready to receive your news and accounts of your celebrations and exploits. Please don't forget to write.